Slingbox covered in our podcast:We reviewed the Slingbox back in Show 3, and featured the updated Slingbox Pro in Show 20. 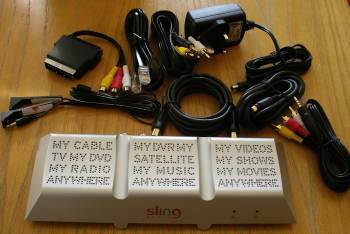 The Slingbox is a gizmo that connects to both your TV equipment and to a home broadband Internet connection, and lets you watch your home satellite, cable, digital or analogue TV, over the Internet, from anywhere in the world. 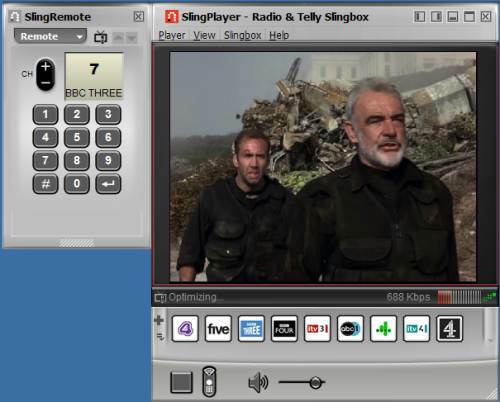 With Slingbox connected to a UK home TV setup, you can use SlingPlayer (the Slingbox software) to watch TV, change channels, take control and even record on your home TV recording equipment, over the Internet. With Slingbox, you can watch & control your TV and digital recorder using your home broadband connection, over the Internet. The Slingbox unit also has a built-in digital TV tuner (DVB-T), so can receive Freeview channels. The Slingbox is perfect for use with a Sky+ box, as you’ll be able to set your box to record a show while you’re away from home. As requested by our visitors, here’s a quick summary of what you need to do, to get Slingbox running. This is only a high-level summary, to help those thinking of purchasing a Slingbox – see later on this page for more detailed help. At home Here’s a quick summary of what you need to do at the ‘home’ end. This is the end where you site the Slingbox unit. You’ll need a broadband connection to the Internet, and an ADSL (Broadband) router. Set up Slingbox, using the supplied Slingbox software. To set up the Slingbox, you need to connect a PC or laptop to the Slingbox via your router. You also need to make some changes to your router configuration to allow external connection to your Slingbox. Once set up, you’ll have a Finder ID that you’ll need at the “away” end. Need a Slingbox? See our Availability section. Need Broadband? Try BT Total Broadband (Free wi-fi ADSL router on BT Total Broadband option 2 and 3) or Virgin Media. Download and install the Slingbox software onto the desktop or laptop you want to use, from slingbox.com. Start the Slingbox software, and enter the Finder ID for your Slingbox – this allows the Slingbox software to find your Slingbox over the Internet, and to start the streaming process – then, you’re able to watch TV and change channels as required. Two sets of A/V (phono cables), SCART-to-A/V Phono adapter, S-Video cable, IR control cable, Ethernet cable, co-ax aerial cable, power supply, quick-start guide. I live in Norway (ex pat) and have been trying for a long time to get UK TV. I can get most channels via Sky, but not BBC and ITV (the ones I really want). I have tried in vain for such a long time, then I heard about Slingbox. I had doubts but I decided to give it a try. I called my brother in the UK and sent him to buy one, we spent a couple of hours on the phone (Norway to the UK) and got it working the same day! I have my pc connected to my 37 inch flat screen tv via wireless LAN and get great quality pictures. Thank you Slingbox, thank you very, very much for giving me back UK TV. We live in Rome and before moving tried to find out if we could get Sky UK. After loads of searching the only way we could get the true UK service was to have a 3½ or possibly 4 metre dish! What a product! I work away from home and spend 4 days per month at home..I was about to cancel my Sky subscription when I found out about this nifty device..
There’s a number of configurations you can use with the Slingbox, but we’ll list a basic one here, to help those looking to get a feel for how to set up a Slingbox. This is the setup to use if you want to get Freeview sent over Slingbox for access via the web. Run the Slingbox setup software. Here’s what should happen: The software finds and detects the Slingbox – it checks the firmware version and updates the Slingbox if needed. You may get messages about no A/V source being connected – but for this config, that’s fine. When complete, you may get another message about no A/V source – continue and there’ll be an option to select the input type. Here, select “Antenna (Free to air)”, then press Scan TV channels. This may take a few minutes. Ours found 40 channels. Set up the router config. The Slingbox software will try to use UPnP to configure your router automatically – for routers that don’t support UPnP, you’ll have to manually configure your router. We had to do this, and it means setting your router to allow incoming Internet requests through to the Slingbox IP address and port number. If you’re up on how your router works, and how to set up Port Forwarding, this is something that you’ll be familiar with – if not, the provided help can guide you (the Help button opens a fairly comprehensive help page on the Slingbox site). Dear Sir/Madam, I would like your advice regarding watching english TV in southern Italy. At home in England I have a Sky subscription, and ideally I would love to watch the Sky programmes I pay for, but freeview would be a good second. I plan to instal an ADSL link to my house in Italy ( using Alice)and this will give me broadband at a good speed plus a telephone line. My existing TV in Italy is five years old and is not a flatscreen and has only got two scart connections, for connection to a DVD and a satellite box. At the moment I am using a satellite system which is basically Italian and which wil get me BBC world news and euronews amongst a lot of itallian and world channels. Would this need upgrading to a TV with perhaps HDMI connections, or is there a way round this. I am going back out to Italy in November and would like to take Slingbox out with me if it will sort out my requirements listed above. I would be grateful for any advice you can give me, and if you could list what I will need with costs, I will get back to you. Hi, Glad to write to you. This is Thomas from Suniin Technology,a Chinese professional manufacturer for developing audio and video connection products. Any product series are of your interest, please contact me for quality products with most competitive price . And was told that there was no way to connect my sling box.do you produce a model that will work with my smart TV and my sky box.